Heading north from Budapest to the Slovakian border, we managed to get lost on the highway. The traffic was insane, as the Formula One was on at Hungaroring, just north of the city. 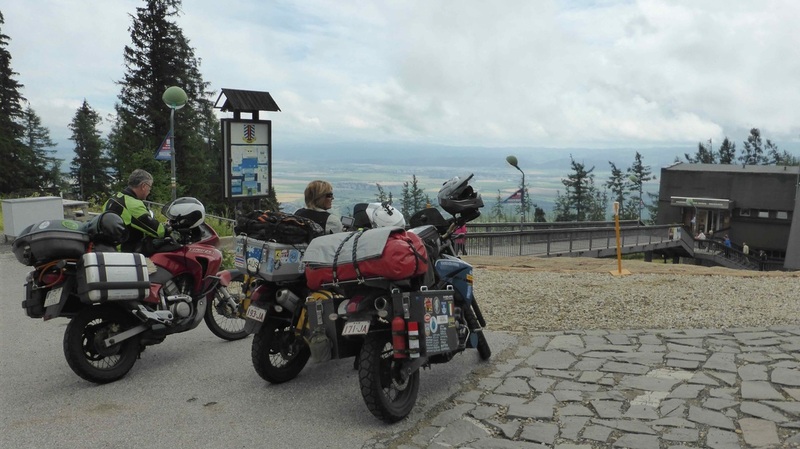 We rode across fairly flat farmland until we crossed the border into Slovakia, where it got more hilly, and thankfully cooled down a bit. A storm hit us in the early afternoon, with really savage crosswinds, we could feel the bikes sliding sideways across the road while we riding! I haven't felt that before. There were branches and leaves coming down all around us, and it got really cold. Heading towards Poprad, we had to cross a range, and found the road was closed for a while for a car race to finish. After waiting in bus shelters out of the rain until the road re-opened, we headed on into the city and found a hotel for the night. Lyn and I had a fairly big disagreement, not a good night all round.